Figure 14.1. Reading-through during translation of bacteriophage Qp RNA: the termination codon UGA of the coat protein cistron is occasionally recognized by Trp-tRNA, instead of termination factor RF2, resulting in the synthesis of much longer polypeptide required for the assembly of the infectious phage particles. 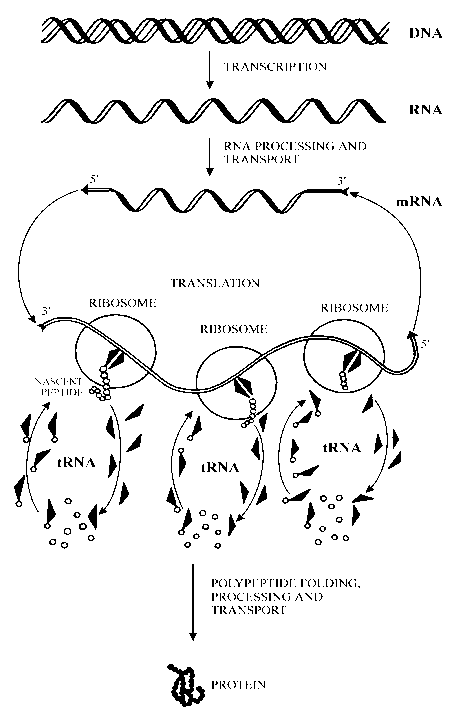 read-through by ribosomes thus resulting in the synthesis of a small amount of the polypeptide much longer than the coat protein (Weiner & Weber, 1973); the read-through polypeptide is a necessary product of the QP RNA translation since it is required for the assembly of the normally infectious phage particle. In plant RNA viruses the expression of open reading frames often occurs through read-through of the UAG stop codon which separates two protein coding regions (Pelham, 1978). The reading beyond a termination codon (read-through) can occur also as a result of frame-shifting at the termination codon site. Moreover, it is a termination codon, in proper structural surroundings, that may induce the frame-shifting and the resultant reading-through. Thus, in addition to the function of a stop signal, the termination codons can serve for a requisite of ribosome slippage or hopping along mRNA (Section 12.4.2). At last, the termination codon UGA, when followed by a special structural element (in prokaryotic mRNAs), or when mRNA bears a special signal in its 3'-untranslated region (in Eukaryotes), encodes for selenocysteine, the 21st amino acid (see Sections 2.3 and 10.2.2). In this case UGA is recognized by tRNASec with the complementary anticodon, UCA; the tRNASec is aminoacylated by serine, and then the serine residue is enzymatically transformed into selenocysteine residue on the tRNASec. In Prokaryotes the selenocysteinyl-tRNASec is bound by a unique elongation factor SELB (instead of EF-Tu) which interacts with the structural element of mRNA; it is this interaction that determines the use of the upstream UGA triplet as the tRNASec-binding codon on the translating ribosome. The mitochondrial genetic code should be mentioned specially (Table 2.2). The codon UGA does not serve as a termination codon in animal and fungal mitochondria. Rather, it codes for tryptophan, just as UGG does. Instead, AGA and AGG codons in mitochondria of Vertebrate animals do not code for arginine but serve as termination codons. Two genera of primitive eubacteria, Mycoplasma and Spiroplasma, use UGA also as a tryptophan codon, rather than as a stop codon (Table 2.1). When a termination codon comes to the ribosomal A site, it is recognized by special soluble proteins which bind to the ribosome and induce the hydrolysis of the ester bond between the tRNA and the polypeptide in the peptidyl-tRNA at the P site (Capecchi & Klein, 1969; Caskey et al., 1969). As a result, the polypeptide is released from the ribosome. Proteins recognizing the termination codons and inducing the release of polypeptide are called termination or release factors (RF). Prokaryotic organisms have three proteins taking part in termination: RF1, RF2, and RF3 (for reviews, see Caskey, 1977, 1980; Craigen et al., 1990). These proteins in Escherichia coli have molecular masses of 40,460, 41,235 and 59,460 daltons, respectively (see Grentzmann et al., 1994; Mikuni et al., 1994). The codons UAA and UAG are recognized by RF1; RF2 is specific for the UAA and UGA codons; and RF3 does not participate directly in codon recognition but is necessary for involving GTP/GDP in the termination process. It is interesting that, in accordance with the mitochondrial code, the mammalian mitochondria have no RF2. Eukaryotes have one termination factor, referred to as eRF or eRF1, recognizing all three termination codons, UAA, UAG, and UGA (Konecki et al., 1977; Frolova et al., 1994). The protein in the monomeric form has a molecular mass of about 55,000 daltons, but in solution it may be present as a dimer. In addition, the second termination factor analogous to prokaryotic RF3 has been shown to exist in Eukaryotes; it is designated eRF3 (Zhouravleva et al., 1995). The molecular mass of this protein is of about 70,000 daltons (614 amino acid residues). It interacts with GTP and shows GTPase activity in the presence of ribosomes. There is evidence that eRF3 with GTP can form a complex with eRF1. Thus, it is the complex eRF1:eRF3:GTP that may be the functional unit which accomplishes termination on the eukaryotic ribosome in a GTP-dependent manner. In the process of interacting with the termination codon and the ribosome, the termination factors RF1 and RF2 of Prokaryotes, or eRF1 of Eukaryotes, appear to simulate the binding of the aminoacyl-tRNA to the A site of the translating ribosome. However, instead of an attack by the amino group of the aminoacyl-tRNA on the peptidyl-tRNA ester bond, this bond is attacked by a water molecule. The transfer of a peptidyl residue to the water molecule, like its transfer to the amino group in transpeptidation, is catalyzed by the ribosomal peptidyl transferase center (see below). The possibility of the protein factor-codon interaction, instead of the codon-anticodon interaction, is intriguing. The protein seems to recognize the nucleotide triplet, and the recognition has a high specificity similar to that for the codon-anticodon recognition. Moreover, in the presence of a suppressor tRNA complementary to the termination codon, the aminoacyl-tRNA and the termination factor compete for binding to the ribosomal A site. Experiments using various modified nucleotides in the termination codons have indicated that the specificity of RF in codon recognition resembles greatly the Watson-Crick base-pairing specificity including Crick's wobble pairing. Direct contact between RF2 and the stop codon has been confirmed in cross-linking experiments where the stop codon s4UAA was used as a zero-length cross-linker (Tate et al., 1990a). The same stop codon could be cross-linked with A1408 of the 16S rRNA, i.e., precisely at the A-site part of the decoding center of the 30S subunit (Fig. 9.3). An interesting idea is that the tertiary structures of the codon-recognizing factors, RF1 and RF2 (as well as eRF1), mimic that of tRNA, including the presence of the anticodon-mimicry element in the proteins. Indeed, an amino acid sequence homology between these termination factors and the C-terminal half (domains III, IV and V) of EF-G which is known to mimic tRNA (see Section 12.2.1) has been noticed (Ito et al., 1996). The function of the termination factors, like that of the elongation factors (EF1 and EF2) and one of the initiation factors (IF2 or eIF2), depends on GTP. Among the termination factors, however, only RF3 and eRF3 have an affinity to GTP and GDP; in the presence of the ribosome they show GTPase activity (see Frolova et al., 1996; Freistroffer et al., 1997). At the same time, it has been demonstrated that prokaryotic RF3 with GTP stimulates the recycling of RF1 and RF2 (their release and rebinding to terminating ribosomes), and seemingly eRF3 with GTP does the same with eRF1 and eukaryotic ribosomes. It is likely that the GTP hydrolysis after termination induces the release of the RFs (or eRFs) from the ribosome. In accordance with its GTP/GDP-dependent behavior, RF3 has been found to possess a strong homology with G-proteins, and especially with G-domains of EF-Tu (EF1A) and EF-G (EF2). The hypothesis may be put forward that the mechanism of the joint action of RFs in the course of termination partly resembles that of the ternary complex Aa-tRNA:EF1:GTP during elongation: RF1 or RF2 mimics tRNA residue, and RF3 plays the part of EF1A (Ito et al., 1996). Like the ternary complex, the complex RF1:RF3:GTP (or RF2:RF3:GTP) occupies the A site with a proper (termination) codon settled there. Then the hydrolysis of GTP may be induced on RF3, and the dissociation of RF3:GDP from the ribosome and the induction of the hydrolytic activity of the ribosomal peptidyl transferase center succeed. The alternative hypothesis is that RF3 (and eRF3) is translocase, thus acting similarly to EF-G (EF2), rather than as EF-Tu (EF1) (Freistroffer et al., 1997; Buckingham et al., 1997). According to this model, RF3 does not promote the binding of RF1 or RF2 to termination codon at the A site, but displaces them from the A site in a GTP-dependent manner, after the peptidyl-tRNA hydrolysis. The termination step with the participation of RFs is followed by the step of the release of deacylated tRNA from the ribosome and the dissociation of the ribosome into subunits. It has been demonstrated that in bacteria two other proteins are involved in the breakdown of the "termination complex", EF-G and the so-called ribosome releasing (ribosome recycling) factor or RRF (Kaji et al., 1969; Janosi et al., 1996). As in the catalysis of translocation, EF-G requires GTP for performing this function. RRF (or RF4) is a small basic protein with a molecular mass of about 20,000 daltons (185 amino acids). There is evidence that a concerted action of both proteins, EF-G and RRF, is necessary for promoting the dissociation step. The mechanism of the action is unknown. It may be that RRF interacts with the vacant A site while EF-G:GTP translocates RRF displacing the deacylated tRNA from the P site. After the ejection of the deacylated tRNA the ribosome loses its 50S subunit, and the 30S subunit can slide along mRNA or dissociate from it (Pavlov et al., 1997). As already mentioned, the termination factors RF1 and FR2 (or eRF1) recognize the termination codon positioned in the A site of the ribosome (for reviews, see Caskey, 1977; Tate et al., 1990b; Tate & Brown, 1992). Thus, the codon-dependent binding of the RF is possible only after the peptidyl-tRNA has been translocated from the A site to the P site. Under in vitro conditions, the AUG triplet and the initiator F-Met-tRNA or Met-tRNA can be bound directly to the P site of the vacant ribosomes, and this may be followed by the addition of the RF and one of the termination triplets, UAA, UAG, or UGA; these in turn bind and induce hydrolysis of the F-Met-tRNA at the P site, yielding free formyl-methionine. It is evident that, in this case, the termination triplet and the RF come into the vacant A site. The fact that the suppressor aminoacyl-tRNA in the complex with EF-Tu and GTP, which possesses an anticodon complementary to the termination codon, competes with the RF in the course of translation also indicates that the RF (RF1, RF2 or eRF1) binds to the A site. Accordingly, the antibiotics affecting the ribosomal A site on the 30S subunit, such as tetracycline and aminoglycosides (Sections 10.3.1. and 10.3.2. ), inhibit the codon-dependent binding of the termination factors with the prokaryotic ribosome (Brown et al., 1993). On the other hand, the EF-G bound to the ribosome in a stable manner (e.g., in the presence of fusidic acid) interferes with the binding of RFs to the ribosome, just as with the binding of the aminoacyl-tRNA:EF-Tu:GTP complex. The protein L7/L12 of the prokaryotic ribosome forming the lateral stalk of the 50S ribosomal subunit contributes to the binding of RF1 and RF2, as well as of the elongation factors. Antibiotic thiostrepton known to block the factor-binding site on the 50S subunit (Sections 10.3.3 and 12.5.3) is a strong inhibitor of the RF binding. The inhibition of the codon-dependent binding of RF1 and RF2 by antibodies against individual ribosomal proteins, such as S3, S4, S5 and S10 of the 30S subunit and L7/L12 of the 50S subunit, confirms that the RF-binding site overlaps considerably both the A site on the small subunit and the site responsible for binding the elongation factors (the factor-binding site, see Section 9.4) on the large subunit of the ribosome (see Tate et al., 1990b; Tate & Brown, 1992). Together with these observations, immunoelectron microscopy studies strongly indicate that RFs are placed in the space between the two ribosomal subunits (interface cavity between the subunit "necks"), on the side adjacent to the L7/L12 stalk, similarly to tRNA residues of the elongating ribosome (Section 9.5). Particularly, the RF2-binding site was located at the subunit interface, comprising the L7/L12 stalk region of the large subunit and the neck region opposite to side bulge of the small subunit (Kastner et al., 1990). The codon-dependent binding of the termination factor (RF1, RF2 or eRF1) is necessary for the hydrolysis of the peptidyl-tRNA at the P site and, consequently, for the release of the polypeptide from the ribosome. As has been demonstrated, the hydrolysis of the peptidyl-tRNA in the ribosome is suppressed by the inhibitors interfering with peptidyl transferase reaction (see Caskey, 1977). Chloramphenicol, amicetin, lincomycin, gougerotin, sparsomycin, and other common inhibitors of the ribosomal peptidyl transferase (Section 11.3) suppress the RF-induced release of the peptide from bacterial ribosomes. These antibiotics, however, do not inhibit the codon-dependent binding of RF to the bacterial ribosome. Hence, the terminating hydrolysis of the peptidyl-tRNA appears to be accomplished by the ribosomal peptidyl transferase center (PTC). There is independent evidence that PTC is capable of catalyzing the formation of the ester bonds between the C-terminus of the peptide and the hydroxyanalogs of the aminoacyl-tRNA or puromycin (Section 11.1). Furthermore, in the presence of methyl or ethyl alcohols and deacylated tRNA, methanolysis or ethanolysis of the peptidyl-tRNA at the ribosomal P site takes place; in other words, the peptide residue is transferred to the alcohol hydroxyl group (Section 11.1). In the presence of other organic solvents, e.g. acetone, the peptide residue can be transferred to a water molecule, i.e. the ester bond of the peptidyl-tRNA is subjected to ribosome-catalyzed hydrolysis; the hydrolysis depends on the presence of deacylated tRNA or its 3'-terminal CCA sequence. In this case as well, the hydrolysis of the peptidyl-tRNA is prevented by inhibitors of ribosomal PTC. It is likely that the codon-dependent binding of the termination factor makes the ribosomal PTC more accessible to water, which is a good acceptor substrate; as a result, the peptide is transferred to water, particularly since under these conditions there is no competing amino group of an aminoacyl-tRNA. This accessibility can be achieved, for example, as a consequence of a certain unlocking (drawing apart) of the ribosomal subunits or a slight opening (loosening) of the large subunit that carries the PTC. Other alternatives, however, cannot be excluded: either some nucleophilic group of the RF protein may participate directly in an attack on the ester bond and accept transiently the peptide, or the RF-fixed water molecule may serve as a specific acceptor. Thus the termination of translation appears to include several consecutive steps. The first step is the recognition of the A site-bound termination codon by the protein factor of termination, that is RF1 or RF2 in Prokaryotes, and eRF1 in Eukaryotes. According to one scenario (Ito et al., 1996), the recognition ends in the binding of the complex of two termination factor, RF1 and RF3 (or RF2 and RF3) in the case of Prokaryotes, or eRF1 and eRF3 in Eukaryotes, involving both the codon on the small ribosomal subunit and the factor-binding site on the large ribosomal subunit. The association with the factor-binding site (located at the base of the L7/L12 stalk) requires GTP. Thus, RF1 (or RF2) or eRF1 recognizes the termination codon, while RF3 or eRF3 binds GTP and is responsible for the interaction with the factor-binding site at the base of the L7/L12 stalk. Another scenario, however, is possible (Freistroffer et al., 1997): RF3 (or eRF3) does not come into operation at this stage, but interacts with the terminating ribosome only after the next step, that is after the hydrolysis of peptidyl-tRNA. The second step involves hydrolysis of the ester bond of the peptidyl-tRNA at the P site. As mentioned above, it is still unclear whether the ester bond hydrolysis precedes the RF3 (eRF3) interaction, the hydrolysis of GTP and the release of RF3 (eRF3), or it follows them. In any case, the ester bond hydrolysis is catalyzed by the ribosomal peptidyl transferase center (PTC) of the large ribosomal subunit, and it is the termination codon-dependent binding of the termination factor to the ribosome that induces the hydrolase activity of PTC. It seems that the RFs somehow provides for the presence of a water molecule as an acceptor substrate in PTC. This may be done either by an organized attack of a specifically bound water molecule on the ester bond, or through a conformational change of the ribosome (e.g., unlocking) allowing an access of free water to PTC. As a result, peptide is released from the ribosome. The ribosome remains associated with the mRNA, the deacylated tRNA at the P site, and possibly the termination factor (RF1/ RF2 or eRF1) at the A site. The third step must be the evacuation of the ligands from the ribosome. The termination factor is probably the first to leave. By analogy with the EF1 and EF2, it may be assumed that the termination G-protein RF3 and the RF3-catalysed GTP hydrolysis play the main role in the evacuation of the RFs. It may be that the affinity of the termination factor complex (RF1:RF3 or RF2:RF3) to the ribosome reduces as a result of the GTP cleavage, and the RFs are simply released by dissociation. Another possibility is the active translocation of RF1 (or RF2) from the A site by RF3 with coupled GTP hydrolysis reaction. As to the release of deacylated tRNA from the ribosomal P site, there is evidence that in Prokaryotes this event is promoted by a special protein, RRF, together with EF-G and GTP. The 30S subunit, however, should not necessarily leave the template after termination; seemingly it can slip along the mRNA for a while without translation and reinitiate translation at the next cistron of the same polycistronic mRNA. The sequence of events in the course of termination, with the reservation that the exact stage of RF3 binding and action (either Step 1, as in the figure, or Step 3) is not yet determined, is shown schematically in Fig. 14.2.